It’s not just wooden floors that need maintenance. Stairs and banisters by their very definition form high traffic areas with a different set of abrasions and wear and tear. Your wood material can be protected with the best varnish, but it still wears off. With our service for staircase restoration, your stairs are in good hands. We have the team and the skills to work on every staircase type. How We Approach Staircase Restoration? 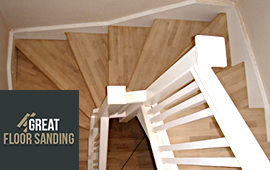 As with wooden floors, every wooden staircase is an individual project that needs a personalized touch. You receive a visit from the experts to survey the area, count the steps, see its layout and how the wood has aged. We take great pride in the attention to detail because we measure and note all imperfections before the actual work can begin. The key to success with our service for wooden staircase restoration in London lies within taking the time and working with a light touch and precision. As most staircases are in small, enclosed spaces we work mainly by hand to strip down the older layers of varnish, staining and damaged wood. The stair spindles additionally complicate the task. Years in the industry have taught us the value of meticulous work and the results speak for themselves. Your stairs will be sanded to a smooth texture and then sealed to a lasting effect. We can even deal with spiral, loft, and contemporary staircases. Say goodbye to splinters and scratches. Precise touch: It’s normal for wood that’s in constant use to gather grooves, splinters, scratches and scuff marks. After our service, your hand glides on smooth wood, which is as good as new. Filling gaps: No more drafts or unsightly gaps. We use a natural mixture of sawdust and raisin to deliver an airtight result when gap filling your staircase or wooden floor. Wood replacement: Creaking stairs? Completely damaged wooden pieces and ornaments? You can count on us to remove the offensive item and replace it with a new one that goes with the stair model. All natural: Every staining and sealing agent we use is made from completely organic ingredients so your home or office is a healthy environment. Book Stair Restoration in London Now! Ready to have your stairs and banisters repaired? We’re here to help you every step of the way! Give us a call at 020 3404 9697 any day of the week and a member of the highly trained support staff will always be there to help you out. To allow maximum coverage for our clients, we work from dawn to the late hours of the day, because we understand how busy your schedule can be. You receive detailed information about how we work, how the service is to play out for you, and flexible scheduling options.